The Micronauts discover a colony of Microspace refugees, but their human captors are in pursuit and may spell doom for the miniature city. Commander Klain is not best pleased with his subordinates, their alien captives having escaped without a trace. Luckily, one scientist has a plan to track them: the alien ship is depleting certain elements in the air as it flies, forming a trail which they can follow. Klain orders his team assembled to head out, and as his staff file out of the room, the commander activates a holographic communications link... to Miles Mayhem! Mayhem lays out his expectations, insisting that the trigger-happy Klain bring the aliens in alive. In the forest city, Oz asks the strange Time Chamber being who it is and how it could have been expecting the Micronauts' arrival, but the entity merely explains that the travelers are honored guests, not prisoners. Continuing to evade questions the Time Chamber instead leads the Micronauts to a banquet in the city's main hall. Inside the building, the team find the walls carved with the history of Microspace – right through to its final destruction! The Time Chamber explains that it and the Kronus citizens hail from the future, and as the Micronauts sit down to eat, their host finally deigns to explain the story of the city. Microspace. The entropy cloud had engulfed all but a single system: Udunax, home of the Kronus. Acting in defiance of his kin, one Time Traveler entered his Time Chamber and used its power to save what Kronus he could. For thousands of years, they floated in the entropic void... At this point, Phen interrupts, pointing out that another Time Traveler had told them it was still possible to save Microspace. And despite the story it has just told, the Time Chamber agrees, claiming that its tale represents merely one possibility, and that the Micronauts may yet choose another path for Microspace. The story continues, with the Time Chamber explaining how time flowed in reverse inside the entropy cloud, and how eventually they found themselves on Earth, thousands of years in the past. To survive on this hostile new world, the Kronus enerchanged with local insects. When Oz notes that the Micronauts are stranded on Earth without another spacebridge to use, the Chamber clarifies that it was in truth the power of Micronus Prime that allowed them to journey between worlds, and claims that whilst they cannot return that way, there are other paths that may be found and navigated. Larissa asks to examine the city's historical records on the entropy cloud, but Kronus suddenly begin running to battle positions, and the Time Chamber calmly announces that today is the day that humans discover the city. Oz orders the Heliopolis to join them in the city to evacuate as many citizens as possible, even as Acroyear and the warrior Kronus fly into battle. Klain is happy to see the swarms of insectoid aliens arrive: now they have surplus aliens, it won't matter if he kills a few. As a grenade tears through the city's buildings, Oz insists that Larissa aid the evacuation with her shields, while he will return for the city's records. The Time Chamber claims the records are unnecessary, but leads the way all the same. As Larissa and Phen bring young and injured Kronus aboard the ship, Klain's men begin catching and boxing the city's warriors. The commander suddenly spots Oz and the Time Chamber, and recognizing the Pharoid as one of his escapees, tosses another grenade their way. The duo fail to get completely clear, and whilst Oz escapes mostly unscathed, the Time Chamber is shattered open, revealing the corpse of a Time Traveler, adorned with a golden mask. Whilst a confused Oz retrieves the mask, which speaks to him telepathically, the other Micronauts watch as the evacuating Kronus dissolve into dust before their eyes. As the helmet explains how the Time Chamber's power had been sustaining the Kronus, Klain grabs Oz, looking forward to exacting something painful on the tiny alien. However, Acroyear soars to the rescue, slicing off the human's thumb and forefinger, before flying his captain back to the Heliopolis. Aboard, the Micronauts mourn the Kronus, while Oz theorizes that Time Chamber itself had enerchanged with the dead Time Traveler and its mask within. Although the Micronauts blame themselves for the extinction of the Kronus, the mask claims that the race would have soon perished regardless, because Earthwar is coming! "Did I detect a tone in the captain's voice? Sometimes I don't think Oz truly appreciates everything we do." "I am surprised you think there are times when he does." "Time is not a straight line. Even though it is always a straight line"
—Admit it, the Sentient Time Chamber just blew your mind. 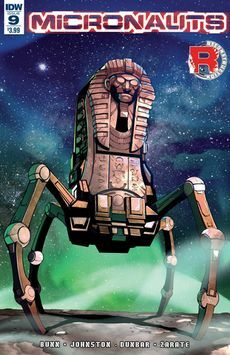 The Micronauts travelled from Microspace to Earth via spacebridge in Revolution #3. The Talisman, the MacGuffin first seen in Revolutionaries #1, is seen during the Time Chamber's description of other paths to Microspace. While the artifact was wildly believed to be a creation of the Thirteen Primes of Cybertron at the time of this issue's publication, its true origin makes any connection it has to Microspace unknown. Given that this is the Hasbro Comic Universe, the Time Chamber could be referring to any number of things when he warns of the Earthwar but it's very likely foreshadowing the sequel series, Micronauts: Wrath of Karza. Other locations seen in the 'paths to Microspace' splash include Stonehenge and the Great Sphinx of Giza. Regular cover: The sentient Time Chamber, by Max Dunbar and Thomas Deer. Subscription cover A: Centaur Karza rears up, by Jed Dougherty; one of a series of black-and-white "Artist's Edition" covers on IDW's January titles. Subscription cover B: Oz surrounded by energy, by David Baldeón and David Garcia Cruz. Subscription cover C: Microtron action figure, by Adam Riches. Retailer incentive cover: A swarm of Kronus surround Acroyear, by J.K. Woodward. "The Hasbro Tribune" editorial page promoting January's Hasbro Universe Reconstruction titles, including G.I. Joe #2, M.A.S.K. #3, Lost Light #2, Optimus Prime #3, Till All Are One #7, Revolutionaries #2, this issue, Micronauts Annual 2017, ROM Annual 2017, and ROM #7.